I am an IRONMAN Certified Coach and a BTF Level 2 qualified Triathlon coach in the UK. 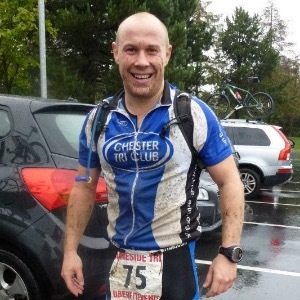 I am a regular coach at Chester Triathlon Club across all three disciplines and am also a coach for Total Tri Training on an individual basis to athletes across the UK. I believe that triathlon should be open to everyone, of all abilities, and no matter how much time you have to dedicate to it, I believe improvements can be made. Whether you want to Win, be first in your AG or “just get round”, I believe everyone deserves a level of success. My coaching approach and philsophy allows for me to be a natural coach choice for beginner athletes, or those looking to build up from an entry level to the next level, or maybe want some personalisation in their training plans and looking to move away from generic plans. With a strong swim analysis/coaching background I am also an ideal coach for those wanting to develop their swim technique, strength and endurance and have already seen all of my athletes, at every distance, improve in this area. My own personal passion for coaching comes from my determination over the last 10 years to see personal improvements in each area of the sport. I believe it is fundamental and vitally important as a coach to do all I can to help someone achieve their goals, no matter how big or small. I am also a firm believer that surrounding yourself with the right people, with the right mindset, can also be a massive enabler to help you succeed. Garmin or other GPS watch with HR. Bike Power meter desirable but not a requirement. Success. Coach Andy Hamilton has been notified of your message.